When Should Seniors Hang Up The Car Keys? : Shots - Health News Most elderly drivers give up the keys only when their child or grandchild intervenes. Social workers say it's important for family members to be aware and look for changes in their parents' driving behavior. With a growing population of baby boomers, officials are bracing for a surge in senior drivers. Statistics tell us that accidents increase after the age of 65, and fatal accidents are more likely after the age of 75. Canada requires physicians to report any concern about a patient's ability to drive, and they are being paid every time they warn a patient. But there's no such requirement here in the U.S. While some seniors opt for public transportation, others stick to the roads. So, often it's up to family members to help seniors decide when it's time to give up the car keys. Some families are already grappling with such decisions. Comedian Dan Nainan travels across the country — and the world — telling tales that keep the laughs coming. Nainan is a funny guy, but there was nothing funny about what happened this year to his dad, who's 82. "One day I got a call, and he was in a parking lot. I guess he had accelerated into a brick wall and totaled his car," recalls Nainan. She was having trouble staying in her lane. Then she tried a U-turn. It was a disaster. "That's when I decided that if she were to drive, she'd kill herself or somebody else, or both. And being a good son, I didn't want that to happen," he says. Nainan succeeded in having his mother's license taken away. He's relieved too that now his parents have a caregiver who drives them around. 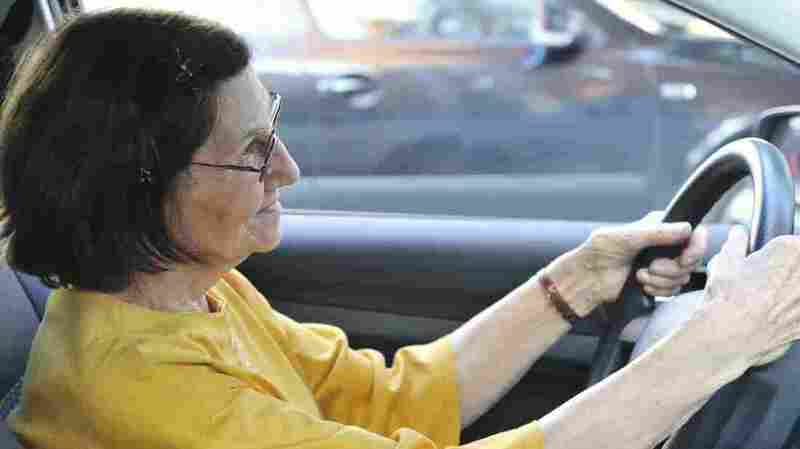 Bunni Dybnis, a social worker at the Los Angeles-based geriatric care service LivHome, says this is typically how older drivers decide to give up the car keys: Their child or grandchild intervenes. "I could probably say it's 99.99 percent not the older adult saying, 'I want to stop driving; help me,' " says Dybnis, because giving up driving feels like giving up one's independence. Dybnis has seen many very stubborn older drivers, which is why it's so important for children to be aware and notice changes in driving behavior, she says. For starters, inspect the car. "You look at the car for dents; traffic tickets; get a call from the hairdresser that they've been to every week, and all of a sudden they didn't show up and you find out they got lost getting there," says Dybnis. Minor fender benders, traffic citations and forgetting where you're going can all signal cognitive decline. Then there's the true test, says Dybnis. Would you let your parent or grandparent drive you or your children? "I see older children say, 'My mother drives only to the hairdresser or market, and that's fine, but I would never let my children drive with her, and I'm even afraid to drive with her,' " says Dybnis. "Gee, not willing to risk your own life or your children's, but maybe somebody else and your parents? That's a huge red flag." If that's the case, it might be time to suggest a driving evaluation by a doctor, rehab clinic or geriatric care service. Vision and hearing can be examined, and they can test reflexes and memory. Some problems can be easily remedied, like removing cataracts or adding hearing aids. But others are more serious and often mean it's time to stop driving. Some physicians are attuned to the unfortunate position this puts families and caregivers in. Dr. Marian Betz, an ER doctor at the University of Colorado hospital in Denver, has developed a tool she hopes could make the conversation about driving easier: an advance driving directive. Like an advance health care directive, it would designate a trustworthy individual to start the conversation about driving when driving becomes hazardous. "Lets say Dad's memory is going and he probably shouldn't be on the road anymore. If he had written down that he trusted his oldest son to help him make the decision, it would make it easier for the son to say, 'Dad, look, you told me to take away the keys,' " Betz says. And when that happens, says Dybnis, be prepared to replace it with something. Offer to do the driving yourself. Hire a caregiver or a neighbor who needs a little extra cash. The point, of course, is not to leave your loved one stuck or isolated.